Zhengzhou CamelWay Machinery manufacture is one of the large-scale enterprise specializing in construction machinery. The company was found in 1983. In 2000, the company passed ISO9001 Quality System certification. The products are exported to Vietnam, Laos, Kazakhstan, Mongolia, Russia, Cuba, Brazil and other countries, being highly praised by foreign friends. 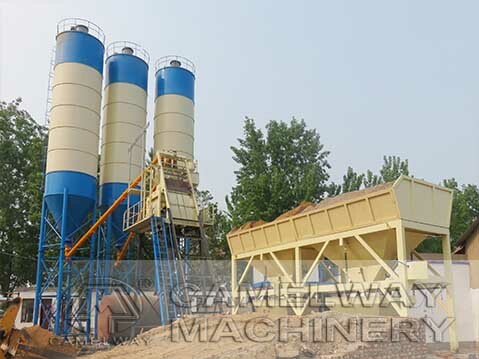 Today, we will talk about the features of ready mix concrete batching plant. Adopt combined structure and modular unit, convenient to install and remove. Adopting the most advanced technologies in the world to ensure high stability and durability. A weighing hopper is used to weigh cement, water and additives, to ensure that the measurement is accurate. Various control system adopt for easy operation. Mixing and aggregate lifting system adopt JS double-shaft compulsory concrete mixer which offers high quality and efficient mixing. If you are interested in the concrete mixer, you can contact us at any time. We will try our best to service for you.